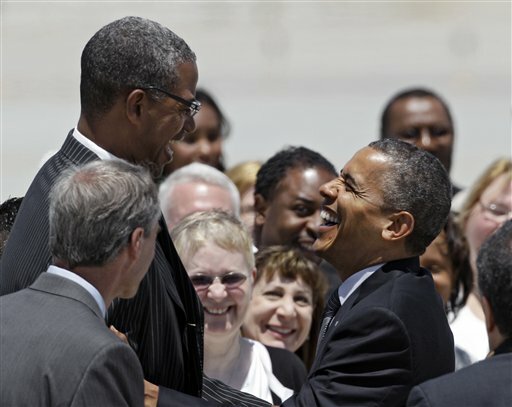 Warrenville Heights, Ohio mayor Brad Sellers greets President Obama at the Cleveland airport last week. When professional athletes finish their careers at a relatively young age, some don’t — or won’t — think about what to do next. Others, like former Bulls forward Brad Sellers, pursue entirely new careers you might not expect. I should correct one thing when referring to Sellers, though — that’s Mayor Sellers to you. Twenty-six years ago, Sellers was the Bulls number one draft pick; fast forward to November 2011, he was elected mayor of Warrenville Heights, Ohio. Sellers put those lessons on the back burner while he secured his education and pursued a pro basketball career. In 1986, after finishing his college basketball career at Ohio State, Sellers heard he would likely be selected in the first round by the Detroit Pistons, with the 11th pick overall. The night of the draft, two camera crews from local Detroit stations came to his home to await the decision. Surprisingly though, the Bulls took Sellers at number nine. He didn’t know, but the Bulls’ fan base was shocked and angry by the selection. Prior to the draft, there were some behind the scenes factions of Bulls management and players that wanted Duke’s point guard, Johnny Dawkins, and leaked it to the press. Since Sellers didn’t quite fit in, he asked Jordan to help him convince Bulls management he needed to be dealt. He was sent to Seattle, played in Minnesota and Detroit and finished up his career overseas. With his playing days over and his finances secure, Sellers knew he wanted to go back home to Warrenville Heights. He played golf and was doing some sports broadcasting but he wanted to continue the work his parents had trained him to do: community service. It didn’t take long (just months after his return) for Mayor Marsha Fudge to enlist him as the economic development director. He held that job for nearly 11 years. Then, a few years ago, Fudge moved on to become the congressional representative of the district. With the former mayor’s encouragement and Sellers desire to improve his hometown, he was easily elected mayor last November. He garnered support from all demographics: young, old, black and white. He believes his family’s ties to the community, especially the elders that were his parent’s peers, were instrumental in this win. Sellers knocked on all the homeowners’ doors when he campaigned, and even now, if a constituent sends a note or email, he will go to their door to talk. He claimed to have no future political aspirations, having just landed the job; but there are Ohio Democrats that want more from him. During a recent campaign stop, Brad greeted President Obama at the Cleveland airport. But for now, he just wants to settle into this new job.